The prologue was incredibly gripping, but because it was set in the past, being thrown right into the present story after it was a little bit disconcerting. I would have liked it if the past storyline had woven into the present one a little more, I was expecting there to be more integration of the past and present and there just wasn’t. I loved the setting, Scotland is a great setting for horror books, the dark and gloomy landscape works really well for a creepy and suspenseful atmosphere and I thought the isle of Skye was an especially great choice, the wild winds, the craggy cliffs, the old schoolhouse, all of it made for a very creepy setting, perfect for this book. 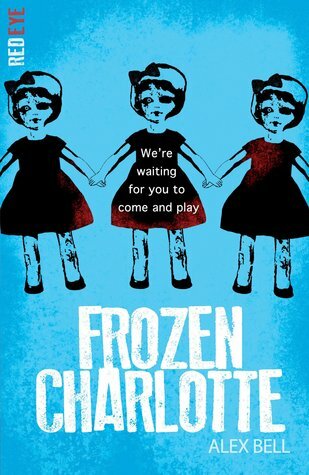 I loved that the author drew on real stuff for the book, the Frozen Charlotte dolls are real things (which I knew) and the Fair Charlotte ballad, which the author used at the start of each chapter (a very cool inclusion) is actually a real thing. Some of the chapters were a little overly long for my taste, which meant the book was little slow to start off with but the pacing definitely got better in the latter half of the book. The characters mostly felt a little flat to me? I mean I liked Sophie but there was nothing particularly special about her and aside from Piper none of her cousins seemed to be particularly fleshed up. I was also a little confused about Rebecca’s motives, because at first it seems like she’s malicious but then the author pulls a bit of a switch towards the end which didn’t really fit. I also didn’t really see how Jay (Sophie’s friend) was relevant to the story? I also felt like the author had a bit of a problem establishing the ages of the characters as they all felt either older or younger than they were, I spent most of the first half of the book thinking Sophie was 13! Also Sophie’s cousin Lilias has such a weird name! Though it does kind of fit, she’s a rather strange little girl! The author was definitely very good at creating a creepy atmosphere, I spent most of the book creeped out. This is definitely not one that you should read at night people! The mystery was also pretty engrossing, as I was wanting to find out what really happened to Rebecca the entire book. Ever since PLL, dolls have creeped me out, but now I hate them even more! The writing was quite simplistic, so although the book is recommended for older readers, I reckon it would be fine for younger readers that can handle more mature content. I thought the slight hints at romance between Sophie and Cameron were kind of weird, especially considering that they’re cousins, I mean they’re not blood related (Cameron is her mother’s stepbrother’s child) but it’s still kind of weird. It did seem like some of the characters made questionable decisions, like why would Sophie’s Uncle stay in that house after all the bad things happened to his kids? Why wouldn’t someone have got rid of the Frozen Charlotte dolls sooner? Why wouldn’t Sophie just leave when all the creepy things started happening? Clearly people in horror books just do stupid things! It wasn’t really explained exactly how or why the Frozen Charlotte dolls were evil? Or why they only affected girls? It would have been nice to get answers to those questions. If you’re scared of needles, just a warning (as I am too) there are a few scenes involving needles in people’s eyes, so I’d just flick past those bits! I thought the twist was decent, if predictable although there are some bits about it that didn’t particularly add up to me. It all just seemed a little bit too neatly plotted for me. I didn’t think the epilogue was particularly needed, I think it would have been fine ending on the six months later bit and not establishing that the dolls were still out there being creepy. Overall, this was a decent, engaging light horror, with a very creepy storyline and yes, although the characters were a bit flat, the creepy setting and dolls definitely make up for it. I liked that it was a quick read and easy to get into and it was great to see a book set in Scotland! If you like Pretty Little Liars, I would definitely recommend giving this book a try! My next review will be of Laini Taylor’s Daughter of Smoke and Bone.